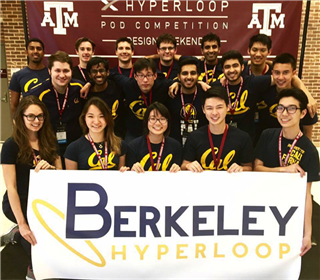 Congratulations to Pacific Ridge alumnus Tyler Chen '15 and the rest of the UC Berkeley Hyperloop Team on being selected as finalists in the SpaceX Hyperloop Pod Competition. In late January, Berkeley Hyperloop joined more than 180 teams from around the world at "Design Weekend" to present their design to judges, media, the general public, and surprise guest Elon Musk! As one of just 22 teams chosen to advance in the competition, Berkeley Hyperloop now has the opportunity to test their pod on Space X's test track this summer. Follow along on the Berkeley Hyperloop Facebook page as Tyler and his team help usher in the future of transportation.